Wine Agerre Txakoli 2018 - Royal Wine Merchants - Happy to Offer! A crisp, refreshing wine with a slight effervescence. Notes of fresh citrus and green apple with good acid and minerality. 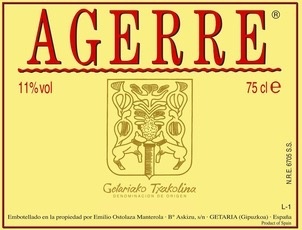 The Agerre family has been growing grapes in Getaria for three generations. Emilio Agerre is the third generation of winemakers and currently runs the winery with the help of his wife and son. The family owns 15 Hectares (37 acres) planted on the slopes of a mountain overlooking the Atlantic Ocean in Getaria. The vines range from 10-30 years old, with the Atlantic climate the perfect habitat for the Hondarrabi zuri. The soils are sandy loam over gravel of Tertiary origin. The soil quality and steep incline allow for good drainage.